When I initially revisited this recording and gave it the Pristine Audio Natural Sound treatment I was delighted with the sound quality I achieved - but ultimately decided a completely new restoration might yield even better results. Hence this 2007 restoration and remastering, direct from the original 78s. 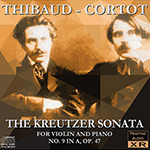 Perhaps the most popular Violin Sonata of all time gets a fabulous treatment here by two of the most eminent chamber musicians of the twentieth century. Every single note of this superb recording is a joy to hear as the musicians draw you into this sublime work. As Robert Stumpf II said in a review of this performance at Classical Net, "...this is the real thing. The players here are making music, not just playing it."